Harambee Stars left-back Erick 'Marcelo' Ouma arrives at the JKIA on March 25, 2019 from Ghana. Harambee Stars jetted back into the country in the wee hours of Monday from Ghana via Addis Ababa, Ethiopia. 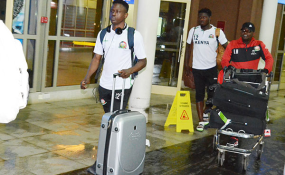 The team - that lost to hosts Ghana by a solitary goal in the final 2019 Africa Cup of Nations (Afcon) group "F" game on Saturday at Accra Sports stadium- landed at the Jomo Kenyatta International Airport (JKIA) at 1.10am, but came out an hour later. Captain Victor Wanyama, who plays for Tottenham Hotspurs in the English Premier League, did not return with the team as he connected direct to his base in London from Accra on Monday. Stars coach Sebastien Migne thanked his charges for a gallant show despite going down with seven minutes left. "Of course I'm disappointed with the loss because we were not far from registering a huge result in Ghana against a top team in Africa," Migne told Nation Sport at the JKIA. "Until the 83rd minute it was perfect for us, but unfortunately in football at the high level you have to be good until the end of 90 or 94 minutes," he added. The Frenchman has since shifted his focus to the final tournament that starts from June 21 in Egypt. "To realise a good Afcon we need to have support from the government as soon as possible because we are late to book the camp in France for this competition and after, to organize going to Egypt," he lamented. The Football Kenya Federation (FKF) tabled a budget of Sh244 million that was approved by the Sports ministry. Only Sh25 million was wired into the federation accounts in preparation for the Ghana game.